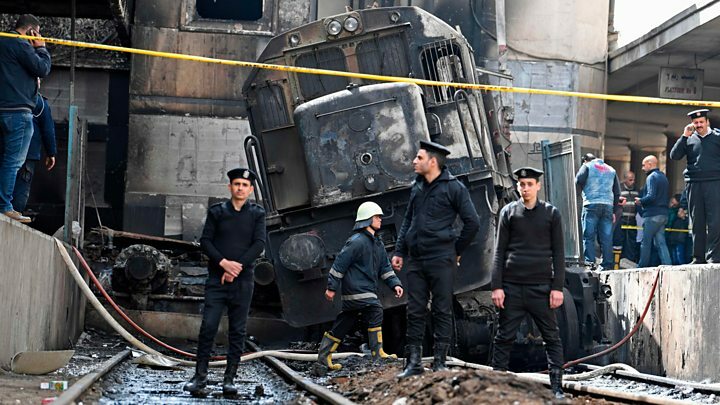 The deadly fire at Cairo's main railway station on Wednesday happened because the train driver left the cabin without putting the brakes on, Egypt's public prosecutors believe. They say a preliminary investigation indicates the driver stepped off the train to argue with a colleague. But the driver, who has been arrested, blames corroded brakes, reports say. The train hit a buffer stop at Ramses Station, sparking a huge fire. At least 20 people were killed and 40 injured. The collision caused the train's fuel tank to explode, setting the platform and nearby buildings alight. Witnesses described seeing several severely burned bodies in the latest disaster to hit Egypt's rundown railways. What do Egypt's prosecutors say? They say the driver left the moving train to start an altercation with another driver on an adjacent lane over the right of way or a minor incident. The unattended locomotive then sped off and hit the buffer stop. But the driver says the train was faulty otherwise "it would not have moved by itself". "The brakes are corroded and the wheels are corroded," the driver is quoted as saying by Egypt's ON TV channel. The privately owned news website al-Shorouk has cited a source as saying the train was undergoing maintenance when it started moving at speed without a conductor. The source adds that this is not the first incident of its kind, explaining that there had been two other cases of a train moving without a conductor that had not resulted in any deaths or injuries. How did Egypt's authorities react? Transport Minister Hisham Arafat resigned hours after Wednesday's disaster. During a visit to the scene, Prime Minister Mostafa Madbouli vowed to severely punish anyone who was found to have been negligent. "We will identify who is responsible for the accident and they will be held accountable," he said. President Abdul Fattah al-Sisi extended his condolences to the families of those who died and pledged to ensure that the injured received the support they needed. Local media published what they said was CCTV footage showing people on the busy platform as the train hits the buffer at high speed and explodes. Another video, taken from a CCTV camera above a nearby subway staircase, appears to show people fleeing as a fireball engulfs the platform. "I saw a man pointing from the locomotive as it entered the platform, and screaming 'There are no brakes! There are no brakes!' before he jumped out of the locomotive," witness Ibrahim Hussein told Reuters news agency. "I don't know what happened to him." Egypt's railway system has a poor safety record, which many observers blame on a lack of investment by successive governments and poor management. In August 2017, 43 people were killed and more than 100 injured when two passenger trains collided outside the Mediterranean port city of Alexandria. The country's deadliest rail accident occurred south of Cairo in 2002, when a fire ripped through an overcrowded passenger train, killing more than 370 people.